Destination Myoko Kogen Ski Resort Guide. Myoko ski resort info, accommodation, hotels, cams, reviews, snowboarding + much more! Light snow showers falling at the top of the mountain today with temps at -1c, and down to -5c with wind chill. Winds will increase up to 25kmh throughout today and temperatures will warm up to +2c tonight. We should see the next major storm system hit on Monday night with the potential to drop major snow. 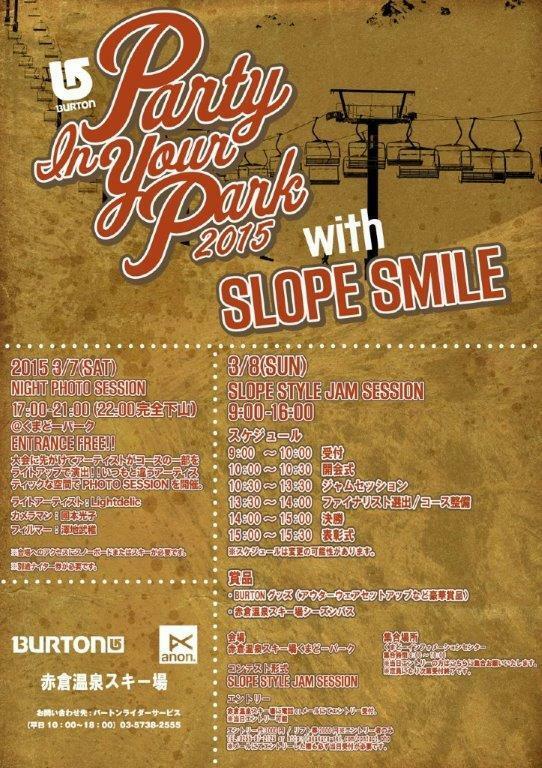 Don’t forget the Party in the Park with Slopesmile today at Akakura Onsen. Don’t forget to keep up with the snow progress via our Myoko webcams. Don’t forget! Got a great Myoko ski video from this season that you’d like to share? Or would you like to show yourself off at The Daily Flake to the world by presenting a guest Myoko snow report? Upload your best efforts and then contact us with the details! Note: We are not a fan of 5 minutes of polecam face shots. Sorry, we prefer something a little more creative. This entry was posted in Akakan / Akakura Kanko, Akakura Onsen, Hiuchi Charmant, Ikenotaira Onsen, Kurohime, Madarao Kogen, Myoko Kogen Snow Report, Myoko Kogen Snow Reports, Myoko Snow Forecast, Myoko Snow Report, Myoko Suginohara, Myokokogen Ski Resort, Seki Onsen, Snow Report, Tangram Ski Circus and tagged Myoko Snow Report 08 March 2015. Ski in, self-contained accommodation in Akakura, Myoko. Myoko Powder Hostel in Akakaura Onsen is Myoko's #1 budget accommodation! Get Myoko car rental deals!